Prosper - 12 years old - He is the older brother of Bo, and due to Bo's young age, is very protective of Bo. Mother died and they went to live w/ their aunt and uncle. Bo - 5 years old - Younger brother of Prosper. Always eager to do lots of things that Prosper always tries to not let him do. Esther Hartlieb - Rich aunt of Prosper and Bo. Loves Bo but hates Prosper and thinks he is a bad influence on Bo. Max Hartlieb - Rich uncle of Prosper and Bo. Victor Getz - Private detective. Hornet (Catrina Grimani) - Girl who loves books. Orphan but doesn't like to talk about her past. 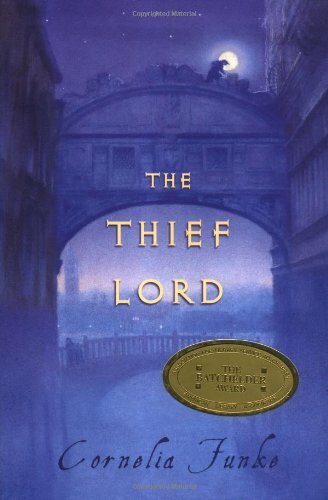 The Thief Lord (Scipio) - 13 years old - A very good and mysterious thief. Ernesto Barbarossa - Shopkeeper that secretly buys stolen goods and sells them for much more than he paid for. Cares mainly only for money and personal gain. Dottore Massimo - Rich person and owner of the shut down movie theater The Stella. Bo and Prosper, who are brothers, run away from their aunt and uncle Esther and Max Hartlieb to Venice. Esther and Max hire detective Victor Getz to help find Prosper and Bo. Meanwhile, Prosper and Bo have moved in an empty movie theater with four kids they meet; Riccio, Mosca, Hornet, and Scipio, otherwise known as the Thief Lord. The Thief Lord, who is a kid himself, gave them the home in the theater and he supports them by stealing things, which they sell to a shopkeeper Barbarossa. The Thief Lord only comes in occasionally, and never sleeps with the kids. Meanwhile, Barbarossa tells the children about one of his customers that needs someone to steal something for him. The Thief Lord accepts the job and meets the client, who is called The Conte, with the others. They find out that the object they need to steal is a wooden wing from a wealthy photographer's house, whose name is Ida Spavento. If they manage to steal it, they will receive five million lira. While Mosca, Prosper, and the Thief Lord are talking to the Conte, Riccio, Hornet, and Bo wait outside. Bo is distracted by a tourist who is actually Victor in disguise. Victor persuades Bo to tell him his name and that he lives in an abandoned movie theater. When the others see Bo talking to Victor, Victor escapes, but watches the kids as they enter a store. Hornet manages to steal Victor's wallet and the children find out that Victor is a detective and is trying to capture Prosper and Bo. Victor finds out they are staying at The Stella. The Stella is owned by wealthy Dottore Massimo. Victor then visits him and finds out Scipio is Dottore Massimo's son. Scipio goes and warns the kids, and they manage to capture Victor and tie him up and keep him in the bathroom. But, Victor tells the kids that Scipio is the son of Dottore Massimo and that he steals his loot from his own house. As they go to see if that is true, Victor escapes, giving them his word he won't tell Esther and Max. The kids decide to just rob the house without Scipio, but in the house they meet Scipio. They are all eventually caught and Ida reveals the story of the wing, which was actually part of a stolen magical merry-go-round that can turn a child into an adult and vice versa. The group decides to team up with Ida, and give the wing to the Conte. On the night of the trade, Hornet tricks Bo, who was very eager to trade into sleeping while the others trade the wing in. After they make the trade with the Conte and his sister, the Contessa, they follow behind on Ida's boat where they find the Conte's island, where he must be keeping the merry-go-round. Meanwhile, Hornet and Bo are captured by the police. Hornet is taken to an orphanage while Bo is returned to Esther. WOW!! Alvin, this entry is incredible! After Hornet and Bo get taken, the rest of the group returns to find them missing. Esther left a message on Victors phone, saying that she has Bo. Victor guesses that Hornet would be in an orphanage. The rest of the group then finds that the money was from the Conte was fake as well. The kids then go to Ida's house and stay there. Victor goes and visits the kids. Victor then receives notice that Bo threw tantrum after tantrum then ran away. Victor finds him in the Stella and takes him to Ida's thinking Prosper would be there. Instead, Prosper snuck away in the middle of the night with Scipio to go to the island where they think the merry go round is. Prosper and Scipio meet the younger version of the Conte and the Contessa due to the fact they took a ride on the merry-go-round. Scipio demands a ride so he can be a grown up, which he does so successfully. But, Barbarossa appears demanding to see the "treasure" Scipio stole. Barbarossa sees the merry-go-round and goes on but can't stop. In an attempt to stop, Barbarossa breaks the wing, rendering the merry-go-round useless. But Barbarossa became a little kid. Prosper, Scipio, and baby Barbarossa return to Ida's, where Ida pretended to be Hornets godmother to get Hornet from the orphanage. Eventually, Prosper, Hornet, and Bo live with Ida while Mosca and Riccio live in an abandoned warehouse. Victor hired Scipio, who sends occasional letters to his dad saying he's okay, but wont come home. Barbarossa ends up being adopted by Esther when he finds out that she is rich. He acts sweet and innocent to get her to take him in, but when he arrives at Esther's house he is caught stealing. Esther then sends him to a boarding school where he is the biggest bully, making children do his homework, polish his shoes, and sometimes even steal things. He also makes the children call him … "The Thief Lord". This book was solid and i will give it a 7.5/10. I didnt like how there was a magical merry go round though. :( y did u click???? Okay, so you got me on the "don't click here". Overall, you've more than exceeded expectations on this. Thank you! Robert "Bobby" Pendragon - Main Character. 14 year old boy. Romantic intrest in Courtney. Traveler. Athletic. Close friend of Mark. Mark Dimond - Long time best friend of Bobby. Intellegent. "Nerd". Courtney Chetwynde - Friend of Bobby. Athletic. Romantic intrest in Bobby. Press Tilton - Bobby's uncle. Described as a very cool uncle.